Hello everyone and welcome to our 9th special Build-A-Flower Release- this month we have the gorgeous Build-A-Flower Gardenia! We are excited that every month we will have a special release of a new Build-A-Flower Set– so make sure to look out for these beauties they are sure to make an incredible collection! Gardenias are known for their sweet fragrance and handsome foliage. In this set this large bloom has four layers including an outline layer. You may stamp all the layers to get a beautiful realistic look, or color the outline image with you favorite coloring medium. Also included in this set are a 3-layer cluster of leaves, an inspirational quote and an endearing sentiment. Make sure to visit designers’ blogs for more details and leave them some love. 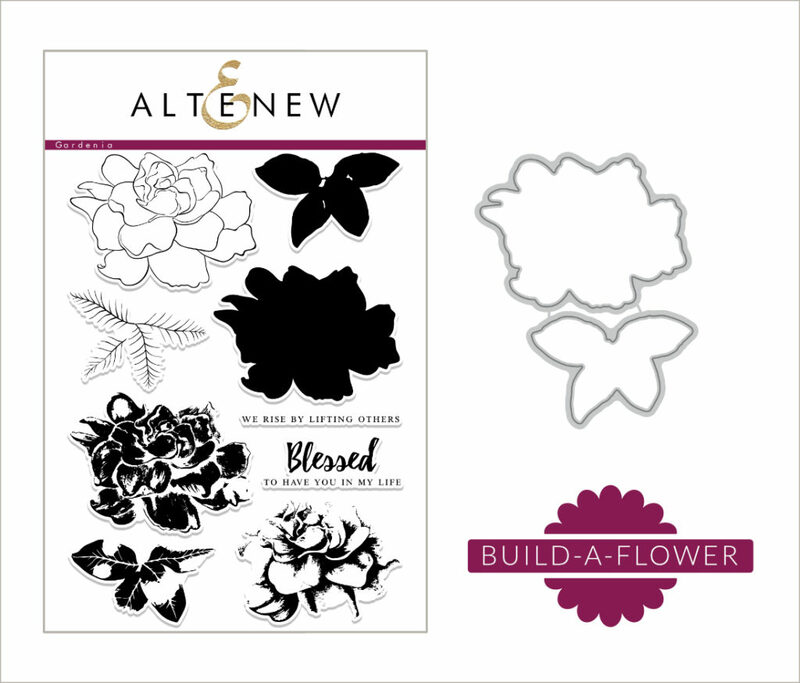 We cannot wait to see what you create with our Build-A-Flower Gardenia. So to celebrate this special release, we are giving away a $30 gift certificate to THREE lucky winners! Please leave a comment here on the Altenew blog for a chance to win. The winners will be announced on Wednesday, November 22nd. Also for a further chance to win please check out what some of the card design team did with this set on the Altenew Card Blog. This is beautiful! I love the bright colors on this layout! I really like this flower. The colors of this project are very sweet. So awesome, who doesn’t LOVE a gardenia, they are one of the most beautiful flowers in my garden. I was so happy to see that was this months build a flower. Such a beautiful flower! I love the build-a-flowers! Terhi’s layout is fantastic – love how she used the gardenia. The colors chosen are gorgeous. I love all your build a flower sets. Winning would be fantastic! Beautiful set and lovely layout! Thank you for the inspiration. Beautiful colors and details on this lovely page! Love the repeated photo and those gorgeous flowers! Fabulous page and love this gardenia stamp set.